Do you love striped afghans but find it discouraging that you have so many ends to weave in? 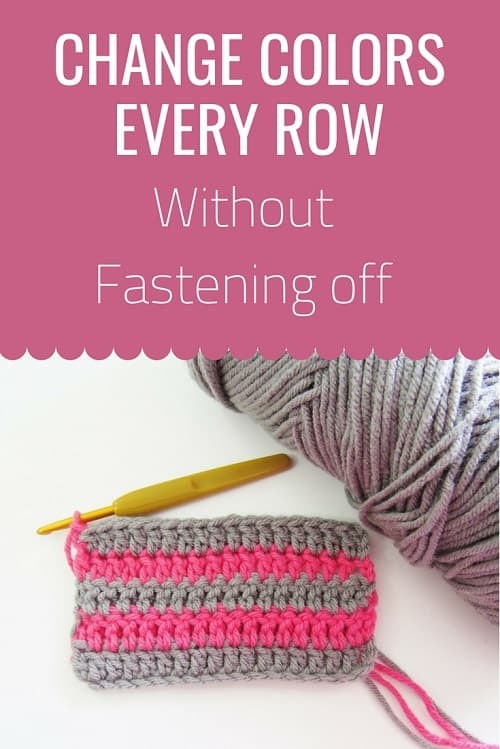 Learn to change colors in crochet without fastening off. Yes, I am talking about 2 colored stripes where you cannot drop and pick up the previous color as it would be at the opposite end of your work. This crochet tip is meant for Afghans with borders and will work with stitches that look the same on both the sides. Thank-you so much. Perhaps now I will dare to tackle such an afghan! You are very welcome. I am glad you found this helpful. Love it. Thank you very much. And looks so clean, no knotting and weaving in. Wonderful. You are very welcome, Lesley. I am glad this was helpful. What if you are using more than 2 colors–maybe 5 or 6. I wouldn't recommend this method for color changes of more than 3 colors. The reason being there is more chance that the ends might snag in the washer. Very creative way to change colors without the typical clipped ends! I will try it. Thanks for sharing this method. You are very welcome, Mary. I am glad I could help. Thanks so much! I have always thought there had to be a way to do that without cutting every time! Can't wait to try this! Thanks again!! ???? You are very welcome. I am always glad to help. Such an easy way to change colors!!! Thank you for the info!!! You are welcome, Claudia. Thank you for visiting my blog. That's brilliant! Thank you for sharing! You are welcome, thank you for visiting my blog. Thank you for taking the time to create this video. It is so helpful and I have pinned it for safe keeping! I am glad you found it helpful. Thank you for visiting my blog.